The original de Blob was a Wii-exclusive and sold a not-to-be-sniffed-at 750,000 copies. With dollar signs in their eyes, THQ went multi-format for this sequel but it would appear that it hasn’t been a gamble that paid off. Sales are reportedly as low as 75k in the first month. Does this prove that platform games are a dying genre? Sadly, yes. 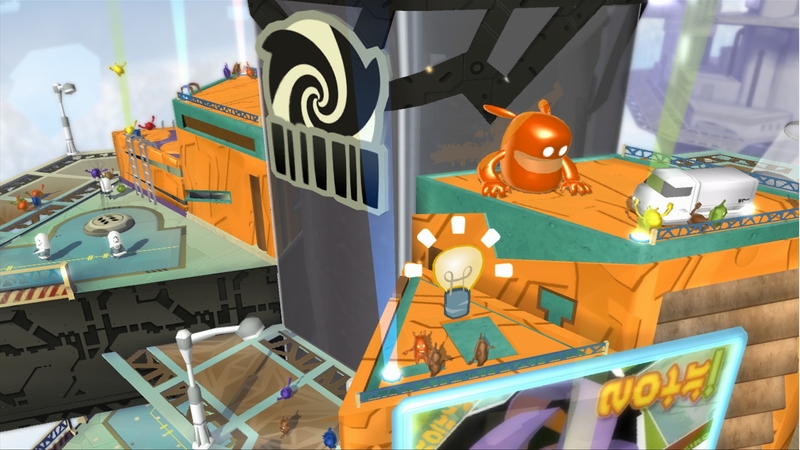 Clearly lovingly crafted, de Blob 2’s first level does a fine job of getting you into the swing of things. There are no enemies or nasty hazards; it’s simply teaches you the basics of how to paint the colourless world. Like all good games new playthings are slowly drip-fed to keep interest levels up. The second level brings paint mixing into the, err, mix and introduces the (occasionally fiddly) wall jumping technique. Later power-ups become available such as the ability to transform into a wrecking ball. These are mostly found in the side-scrolling underground sections, all of which are rather short and sweet. The first four city-based levels, which take around an hour each to finish, are pretty much identical in design and content. 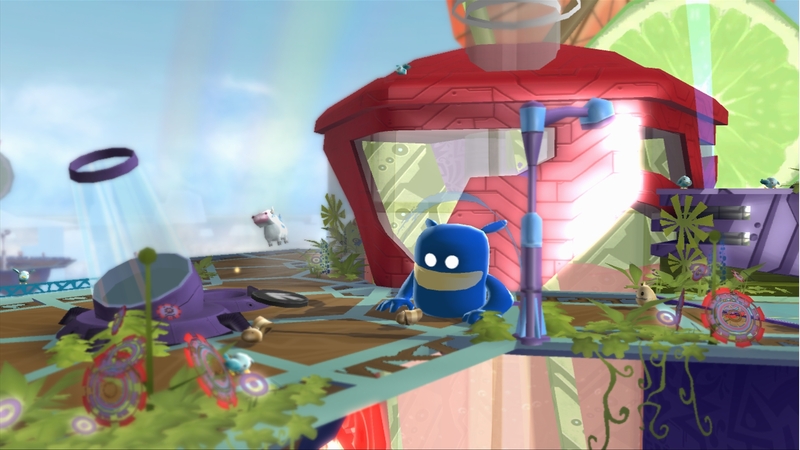 Early enemies can be killed simply by repeatedly using Blob’s homing attack while the puzzles don’t amount to much than changing colour and then pressing switches of a corresponding hue. Come level five though – a fizzy drink factory in which you’re tasked with getting production back up and running – things pick up massively with enemies that can only be killed if you’re the same colour as their helmets, or by using the dash manoeuvre. It’s from this level onwards that the level design comes into its own too. There’s a frozen power-plant that’s become a giant ice-rink and later a zoo that’s being used as a prison. The last level has a whiff of Super Mario Galaxy about it too and while there aren’t many boss battles the few that do feature wouldn’t feel out of place in a Mario game either. Each level has a time-limit but fortunately extra time can be gained by painting houses to free the inhabitants. If you feel the need to paint everything in sight, smash every container and find all the light bulbs – which are used to increase Blob’s stats – then it’s best to wait until the level has been finished because the timer is removed. To find and do everything on every level will take an insane number of hours. 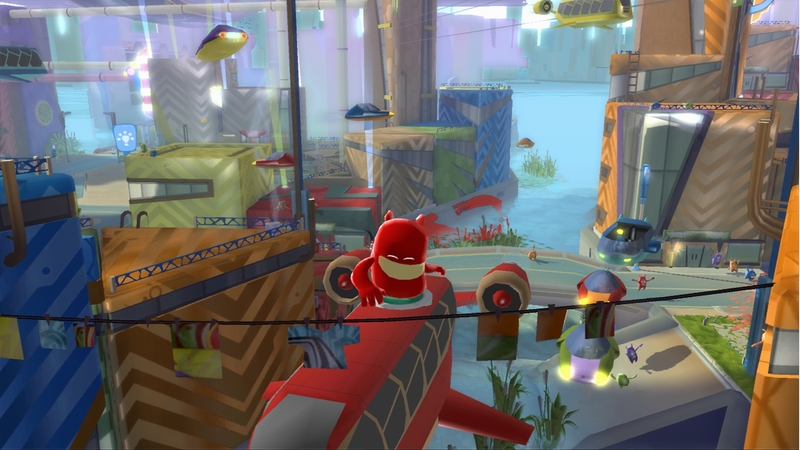 Much like MySims and the LEGO games, de Blob 2’s characters and levels are basic in geometry but because it has a style to call its own it never looks dated or basic. There’s a gentle use of object blurring and the music is worth a mention too – as the levels become filled with colour the music becomes louder and more energetic. The CGI cut-scenes are also nicely done and usually quite amusing, especially the clip with baddie Comrade Black daydreaming about becoming an ice figure skater. Blob, too, is an enigmatic fellow, always grinning and pulling mischievous poses. A second player can take control of Blob’s robotic friend who is armed with a laser canon, in case you ever need a hand. With the average age of a gamer higher than ever it’s not hard to imagine not being able to purchase a platform game over the counter without it having a cartoon or movie license attached. Providing you don’t count Mirror’s Edge as a platformer, there hasn’t been a single Xbox 360 platformer released yet that isn’t part of an existing brand or licensed affair. Don’t let this genre fizzle out and die; let some colour into your life and give de Blob 2 a chance. It isn’t perfect, but it’s a lot of fun once the yawnsome opening levels are out of the way.